Come and celebrate Wynwood Brewing Company’s Gold Medal win for its Pop’s Porter in the Robust Porter category at the Great American Beer Festival 2014! For the whole weekend the Pop’s Porter will be in a Happy Hour “kind of mood” with pints priced at $4 and growler fills at 15% discount. Get to know this delectable beer – which just won top honors at the most prestigious competition of American beer – during this weekend at the Wynwood Brewing’s Tap Room. The Tap Room is located at 565 NW 24th Street in the Wynwood Arts District. WHAT: Wynwood Brewing Pop’s Porter Happy Weekend: A Celebration of the Best Robust Porter in the U.S.
including live music, art, and yoga + all weekend discount on Pop’s Porter pints and growler fills. 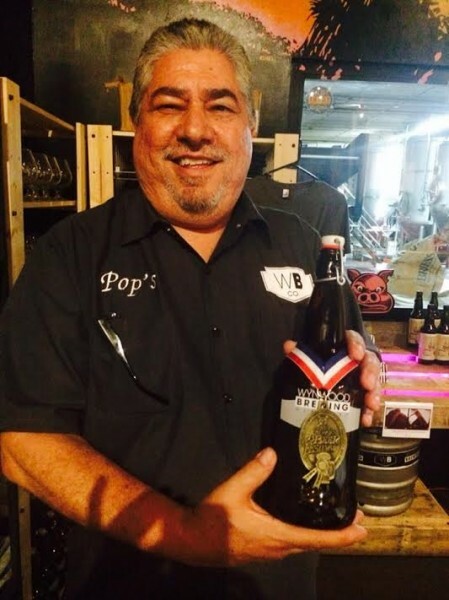 Named after Luis “Pops” Brignoni – co-founder with his son Luis Brignoni of WBCo., Pop’s Porter is a Robust Porter made with “a blend of roasted malts that gives the beer a nice, roasty aroma with hints of chocolate and coffee. The malts contribute to the deep dark color of the beer.” The beer has an ABV of 6.2%, a Hoppiness of 41.0, and Color (SRM) of 36.9. 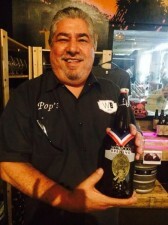 Pop’s Porter gold medal is the first for a brewery in the City of Miami in the Great American Beer Festival 32-year history. On Saturday, October 11 at 2 p.m. the Tap Room will be opening an exhibition by artist Alexis Frias a.k.a. 8BitLexicon and will be having a special cask tapping at 5 p.m. of The Piglitz – a 5gal firkin of a dry hopped Imperial Marzen brewed with Italian spring water aged on pumpkin pie and bacon. Live music concert by Inez and Kazoots will start at 8 p.m.
On Sunday, the Tap Room will open at 10:30 a.m. for a session of Om Brew Yoga with Shelah Davis. Fee for an hour long relaxing yoga session and a pint of beer is $15. Registration needs to be done online.